Canada’s first National Housing Strategy (NHS) signals the federal government’s re-engagement in the housing sector in a big way and that is great news for women who are homeless or experiencing housing instability. A Place to Call Home breathes new life into the housing and homelessness sector because this 10-year plan details how a $40-billion investment will move 530,000 Canadian families from housing need and reduce chronic homelessness by 50%. Up to 100,000 new housing units will be built and 300,000 will be repaired or renewed. Out of the NHS is the redesigned federal homelessness strategy, Reaching Home, which will roll out in April. This new strategy will see $2.2 billion over 10 years to tackle homelessness, and total investments will double to reach $237 million a year. If the NHS is fully realized—the right to housing will be entrenched in legislation and a federal Housing Advocate will be established to ensure the law is enacted on the ground. A National Housing Council of diverse representation, including people with lived expertise will be created to inform system changes. A Community-Based Tenant Initiative will help immigrant and refugee women identify suitable housing and a public engagement campaign will reduce stigma and discrimination while promoting the benefits of inclusive communities and housing projects. How will it help women? The National Housing Strategy will benefit women because over 50% of households in core housing need are female-led. The NHS also commits to allocate at least 25% of the $40 billion for projects that support women and their families and girls with women fleeing violence prioritized. The strategy also commits to specific actions that will engage women at a higher level in describing their own experiences and solutions related to homelessness and housing instability. 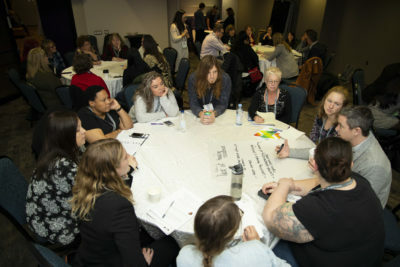 It includes an annual Women’s Housing Symposium and targeted research on women’s housing needs—but what remains to be seen is how the government will allocate funding to ensure women benefit and how they will specifically target the most vulnerable women who face multiple marginalizations or are invisible to the mainstream systems. The NHS commits $241 million to enhance housing research, data and demonstrations to identify barriers to accessing housing; measure and assess the impact of existing housing policies; and identify research gaps. Research priorities will focus on the housing needs of Canada’s most vulnerable populations, including women and children fleeing violence. Demonstrations that support sustainable, energy-efficient, accessible, age-friendly and socially inclusive affordable housing will be prioritized—such as pilot projects testing innovative housing responses to situations of family violence. In 2011, 60% of female-led Indigenous households in Nunavut lived below housing standards. It is not uncommon for the scarce emergency shelters in Northern communities to serve as permanent housing for many women because of the lack of transitional and second-stage housing in these communities. Housing in the North has been identified as a key priority area under the NHS and initiatives are expected to have positive effects on Northern women and Indigenous households. The Community-Based Tenant Initiative is expected to help immigrant and refugee women in the search for suitable housing and provide them with more information to negotiate tenancy agreements. The Status of Women Canada GBA+ lens was applied throughout the development of the National Housing Strategy and as described in the Federal Plan for Gender Equality and UN Habitat III commitments will be used to monitor and evaluate its implementation over the next decade. Clearly many of the strategies will have a positive impact on women and girls, but there are still knowledge gaps that will make it difficult to assess where the 25% investment will have the greatest impact. While the NHS proposes inclusive measures for women, there are some gaps in Reaching Home. Poverty, lower wages, intimate partner violence, sexual abuse, addiction issues and mental and physical health challenges are some of the many factors that make women vulnerable to homelessness. These factors feed into why women experience homelessness differently than men, which must be accounted for in Reaching Home. The “hidden homeless” which includes women and girls who are couch surfing, incarcerated, hospitalized, being sexually exploited, in foster care, living in unsafe or unsuitable housing, and aging in unstable housing are not currently reflected in homelessness statistics. Developing and adopting a national definition of homelessness reflective of women’s diverse realities is a critical first step for Reaching Home. In addition, the domestic violence and homelessness sectors operate completely separately, and many women are poorly served by both, or not served by either—especially Indigenous women and others with multiple marginalizations. The domestic violence system excludes women who are categorized as being homeless from accessing their services. Outside of a handful of women-operated shelters for women who are homeless, the mainstream homeless system is largely designed for men often forcing women fleeing violence into a co-ed environment which they avoid because of safety risks. Until this structural issue is corrected, community entities could end up allocating the 25% investment to women in the homeless system—missing most woman and likely some with the most acute needs who will not or cannot access either system. Reaching Home must address the unique and specific needs of women experiencing homelessness and break down the systemic barriers that leave women without support or housing. While the 2016 coordinated Point-in-Time Count found 39% of respondents experiencing homelessness self-identified as women, we know this data underestimates the real number of women experiencing homelessness in Canada. That’s why we need to get Reaching Home right. Establish a national definition of homelessness aligned with the Canadian Observatory on Homelessness. This would make it clear that the domestic violence system and women in ‘hidden homelessness’ are in scope and eligible for HPS/Reaching Home money. Ensure large scale, structural engagement of women with lived expertise to develop and monitor the implementation of the right to housing. Under the more inclusive definition of homelessness, require data from the family violence sector to be included in the homelessness data systems to provide a more fulsome picture of the situation. Find ways to make visible how women experience homelessness and move through systems.